It's always hard to put up medical appeals, but Caitlín R. Kiernan needs financial help -- you can read about it at her journal, over at http://greygirlbeast.livejournal.com/428785.html. 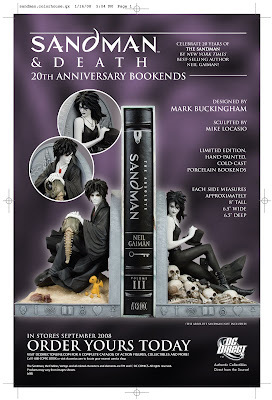 Here's the "Absolute Sandman Not Included" ad that DC will be running for the Mark Buckingham bookends. Neil, I am getting impatient with you! I read part of The Graveyard Book in the "M book" and now I would like to read the whole story. Now. When is "The Graveyard Book" coming out? A tentative date would be kind....thanks! You can't get impatient with me until the book is finished. I still have to finish writing Chapter Eight (which will happen in the next few days), then do the second draft of Chapter Seven, then read the whole thing through and make sure that it's all the same book and that Mr Pennyworth doesn't become Mr Pennyweather somewhere in the middle. But the book will be out by Hallowe'en. Come high water or Hell. Probably in the shops end of September. I'm playing with Last FM whenever I'm in front of the computer. I love having Radio Me -- the idea of a radio station that magically plays only stuff I like when I'm away from home or away from the iPod. And I was surprised to discover there are people out there with musical tastes so scarily close to mine (which is, in my head, so all-over-the-place as to be uncategorisable) that I've started checking out things they like too. Gave in on the friending people thing, because, as someone pointed out, it made it easier for people than just bookmarking my page. I read with interest your recent advice on fountain pens and ink. Personally, I use a pen that was designed for me by, Cowgill, my engineer. It is superbly engineered and I have only ever had to fill it twice. I use a special concoction of Wizard Blenkisop's - his Black as Night Everlasting Ink. Suffice to say that the refill was only necessary when the pen was used to counteract an attack by Beaver Hateman. If your readers desire to improve their penmanship may I recommend the services of the writing master Benskin. I know that he is always on the look out for new students.